Chugoku Electric Power Company operates two nuclear power plants and is currently constructing a third on the Japan Sea coast in Matsue City, the capital of Shimane Prefecture (Shimane-3, ABWR 1,373 MW). On the other side of western Honshu (Japan's main island), it plans to build two nuclear power plants on the Seto Inland Sea coast in Kaminoseki Town, Yamaguchi Prefecture (2 x ABWR, 1,373 MW). Kaminoseki Town comprises a peninsula and several islands. It has a population of 3,600 people. The proposed construction site is on Nagashima Island. Nagashima is connected by a bridge to the mainland. Iwaishima Island, which has a population of 500 people who are almost all opposed to the nuclear power plant (NIT 125), is just 3.5 km across the sea from the construction site. The surface area of the proposed site is about 330,000 m2, about 40% (140,000 m2) of which will be reclaimed from the sea. Cooling water will be taken from the north side and released on the south side of the island. Tunnels will connect the inlet and outlet to the turbine buildings, which will be located inland of the reactors. The reactor building of the second plant will be located on reclaimed land. Preparation of the site is scheduled to take five years and reclamation work three years. The first plant is scheduled to commence operation in 2015, while the second plant is scheduled to commence operation in 2020. The only settlement on Iwaishima Island directly faces the construction site across the narrow channel. The islanders' livelihoods are based on fishing and small-scale farming. 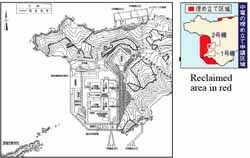 When the plan for a nuclear power plant first emerged in 1982 the overwhelming majority of the island's population were opposed to it and in 1983 the then Iwaishima Fishing Cooperative passed a resolution opposing the plan. To this day, 90% of the island's population opposes the plan. For the last 27 years they have held a demonstration every Monday under the slogan "We will not sell the sea for a nuclear power plant." The demonstration has now been held over 1050 times and has become part of the local culture. Kaminoseki as a whole has become polarized over the issue. Based on a December 2000 survey by the Asahi Shimbun, 46% of the population is opposed to the nuclear power plant while 33% is in favor. In a town like Kaminoseki, where the population is dispersed between several settlements, it is difficult to reflect the true feelings of the people. 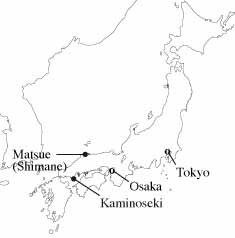 The region around Nagashima and Iwaishima is isolated and under-populated. 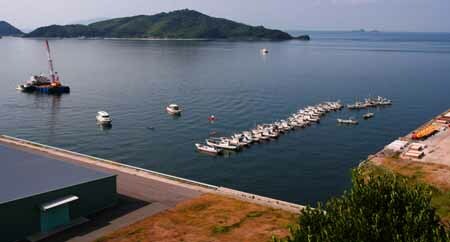 Because it has largely escaped development, the Seto Inland Sea of fifty years ago has been preserved. People call it "Japan's Galapagos". The Ecological Society of Japan, the Ornithological Society of Japan and the Japanese Association of Benthology have called for the cancellation of the nuclear power plant project. Anyone would wonder why this of all places was chosen to build a nuclear power plant. A major problem is that the government accepted Chugoku Electric's woefully inadequate environmental assessment. The Ecological Society of Japan strongly criticized Chugoku Electric's environmental assessment saying, "The survey and analysis of each species is inadequate." 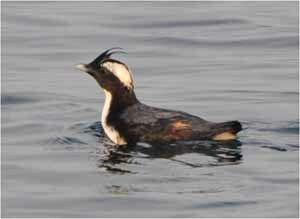 "It fails to grasp the development, breeding environment and food chain for the species." "No assessment deserving the name of an ecosystem assessment has been carried out." On October 9 Chugoku Electric attempted to begin reclamation work, but 30 Iwaishima fishing boats tied together with mooring ropes blocked the work. The fishing boats, supported by young people in sea kayaks, managed to prevent Chugoku Electric from making any progress for four weeks until October 7, when, using diversionary tactics, Chugoku Electric managed to drop two marker buoys in the sea. With this it claimed to have commenced reclamation work. The continuing standoff grew ugly on the morning of November 8 when people on a fishing vessel supporting Chugoku Electric began hitting the sea kayaks with bamboo rods. Protesters were attempting to prevent Chugoku Electric's contractors from throwing concrete blocks into the sea. The concrete blocks were thrown from a floating platform with no regard for the safety of the protesters beneath. One protester fell into the sea. He was hauled into the fishing boat, where he was man-handled by the people on board. He lost consciousness and was taken to hospital suffering from hypothermia. The people of Iwaishima continue their struggle to protect their fishing ground and their lifestyle and in so doing to preserve the biodiversity treasure house of "Japan's Galapagos". Meanwhile, Chugoku Electric has taken them to court to obtain an injunction on the grounds that they are obstructing its business operations.